Well, I haven’t written a blog in 8 months, so I guess the first thing I learned is that I'm waaaay too busy for that during the season! Good intentions, am I right? The season was beautiful, heartbreaking, impossible, infuriating, sublime, elation, pure bliss, crushing disappointment, deeply sad, and perfect, all at once. It was insane, bountiful, fast-paced and jam-packed, and I’m so proud of what we accomplished on the farm. A lot of things went right, and a lot of things went wrong, but that’s the life. Growing anemones, ranunculus, lisianthus, AND heirloom mums for the first time, utilizing our hoop house space, as well as really ramping up our 'Cool Flowers' game. Assisting and teaching at a Floret design workshop - an incredible opportunity that left me with even more flower friends, even more awe for the genius of Erin Benzakein, some essential new design skills, and the opportunity to help others as a “den mother” during the new online workshop. Building and maintaining our roadside flower stand - an excellent new outlet for overflow product. Designing for our biggest wedding ever, including 60 centerpieces and two 4’ wide floral chandeliers. I hope this post offers a little bit of encouragement, commiseration, and get-up-and-go for you! I've also included some variety notes at the end for anyone who wants a deeper dive. Don’t cut corners – and you know when you’re doing it. Early in the season, we tried occultation on a few of our beds - we watered them to get the weeds to germinate, then covered them with black plastic for three weeks to kill all the weeds beneath. At first, we laid the plastic out and just set bricks, boards, and rocks on it to keep it down. This did not work, as our strong spring winds just tore the plastic right out from under those weights, and tore the plastic even when we anchored it with pins. I knew when we were doing it that we should just bury the edges, but I wanted to get it done fast, so I just weighed them down. I ended up doing the job way more than once - replacing that plastic over and over after every strong breeze, and then finally digging the shallow trenches I should have made right off the bat. So do it right the first time, when you know the right way, and you’ll save yourself tons of time and aggravation. I knew that the dahlias I potted up in the spring needed more light than was available under the benches. I thought, nah, they’ll be fine, and I never even PLUGGED IN the lights that were already set, much less got the few extra lights I needed. As a result, my dahlias were leggy and weak, and instead of getting blooms earlier, I probably got them later than I did last year, and the plants were not happy. Similarly, I knew I needed netting on my heirloom mums, but did I put it up? Of course not! The plants shot up, toppled over onto each other, and snapped stems, but all I could do at that point was corral them - this helped, but I know I would have had healthier plants, better flowers, and more of them, if I had take the 5 minutes needed to set up the netting in June. Another way to do it right the first time is to think about the other end of the process you are starting - are you tying 10,000 knots that will be impossible to untie at the end of the season? Could you tie a slip knot instead that you can untie with one flick of the wrist? What you’re doing right now might save time in the moment, but think of your sad, tired October self and take pity on her. The golden ticket, of course, is a process that is easy now, and easy later. Thanks to Bare Mtn Farm (what an absolutely indispensable resource they are) - I found one of these with row cover and landscaping fabric. Instead of rolling up the cover, just fold it back and forth like a fireman’s hose, or an accordion. Secure it with two pieces of baling twine - loops and a slip knot - and label it. In the spring, instead of rolling it out (always a pain), you just untie it and pull out the accordion, and it’s a one-person job. Absolute genius lifesaver. Here are the hoops (obviously not doing much, but I didn't have a picture of the tunnels with row cover - this was when I decided to let the frost come & get my dahlias). 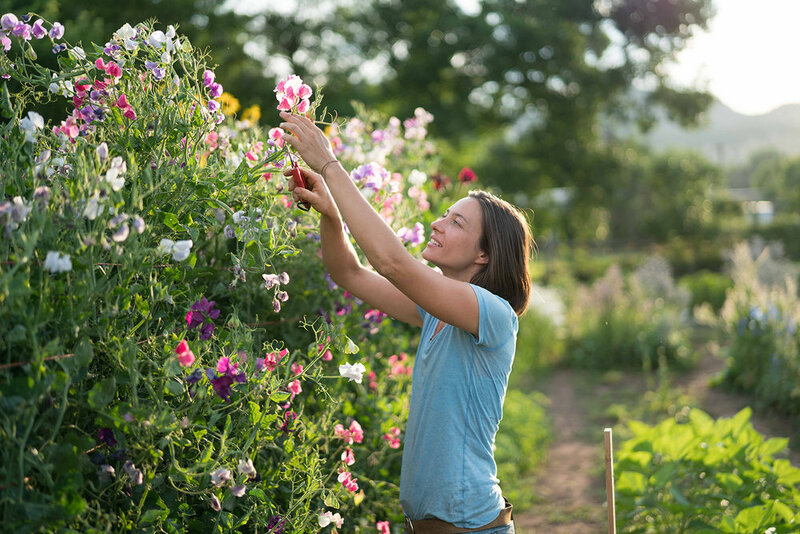 I’ve never regretted investing in something big for my farm, whether it was a nursery or an employee. I know I need it, I’ve thought about it a thousand times, and when I finally pull the trigger I just think - WHY didn’t I do this earlier!? That was true for landscaping fabric this year and last, and it was true for a couple of things this year - my big fancy shade cloth, and my low hoops tunnels. The shade cloth was expensive, but it was absolutely necessary for us to grow the gorgeous anemones and ranunculus we had in our hoop this spring. They would have had shorter stems and a shorter bloom season without it. The heat reduction was significant, which is key because our hoop house does not have roll-up sides for ventilation. As for the low hoops, wow did they save my bacon. Early in October, we had a steep drop in temperatures and a couple inches of snow. I still had a few weddings left and I REALLY wanted to save my dahlias. So I finally got a hoop bender from Johnny’s, got the conduit and everything else from Home Depot, and figured out how to build a low tunnel. I covered my dahlias with Agribon, over the hoops, and they survived to see another day. The $200 or so I invested in that project was ABSOLUTELY worth it, and I now have tunnel infrastructure for next year - I’m planning to fill a few beds with lisianthus, and they’ll grow a thousand times better under a bit of plastic in those low hoops. On the other hand, you’ll definitely kick yourself if you don’t invest in something you really do need, before you need it - this year it was row cover. I knew ours were holey, dirty, and not worth much, but I put off buying more because… it wasn’t exciting? When the end of the year rolled around, I didn’t have the row cover I needed for my sensitive crops, and we lost plenty to just a light frost - only because I didn’t get online & press BUY. Better believe I’m stocking up now. Try Everything. Then, Try It Again. Savannah Charlton mums - just incredible. This one stem lasted 3 weeks in my house. A really fun flower crown I got to make in October with all those mums! Photo by Nelson Esseveld. Seaton's Ruby - accidentally got this one, but it ended up being a real fave. Finally, a giant armload of gorgeous long-stemmed bells. Try, try again. I’m stubborn, and I have a hard time giving up on anything - thanks to parents who told me not to be a quitter (that’s a blessing and a curse!). 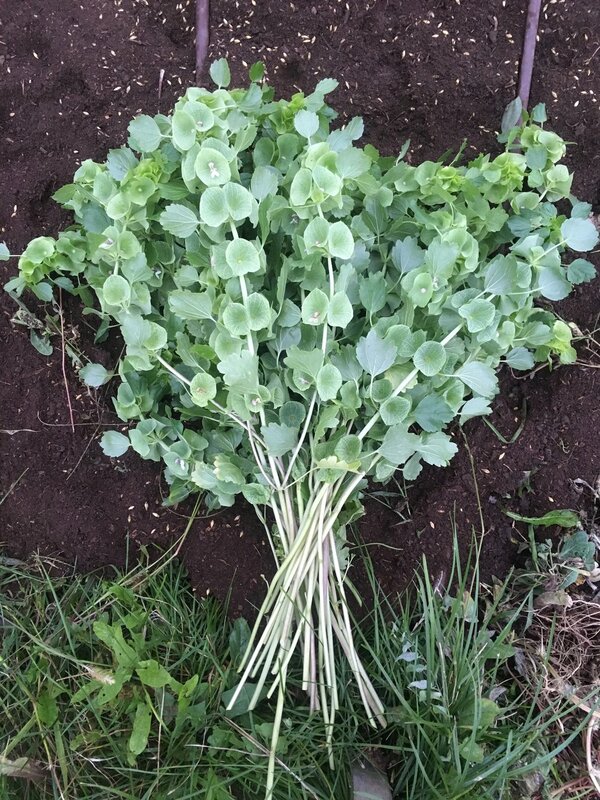 So when I couldn't get Bells of Ireland to germinate or grow well for the first two years of flower farming, I just kept planting them and I finally figured out a great formula - freeze the seed for at least 2 weeks, soak it for a day, and sow it without covering it, in a shady bed. They LOVE shade! I finally had an excellent crop of bells this year, and I’m not looking back. But I’m also pretty fearless, and I love to go all in on something I really care about or want. I REALLY wanted ranunculus. I was convinced that they wouldn’t do very well and might even be a loss for us, but they were incredible. I never would have known that if I hadn’t tried them - and I’ll never go a season without ranunculus again. We started them in February, pre-sprouting them in potting soil for 2 weeks at cool temps after soaking them in aerated water overnight. They went in the ground at 6x6 in my hoophouse at the beginning of March, and were producing absolutely incredible blooms by the 2nd week of May. They bloomed like crazy for 6 weeks, and held in the cooler for over 2 weeks, still perfect for wedding work. We were still using ranunculus in wedding designs at the end of JUNE. 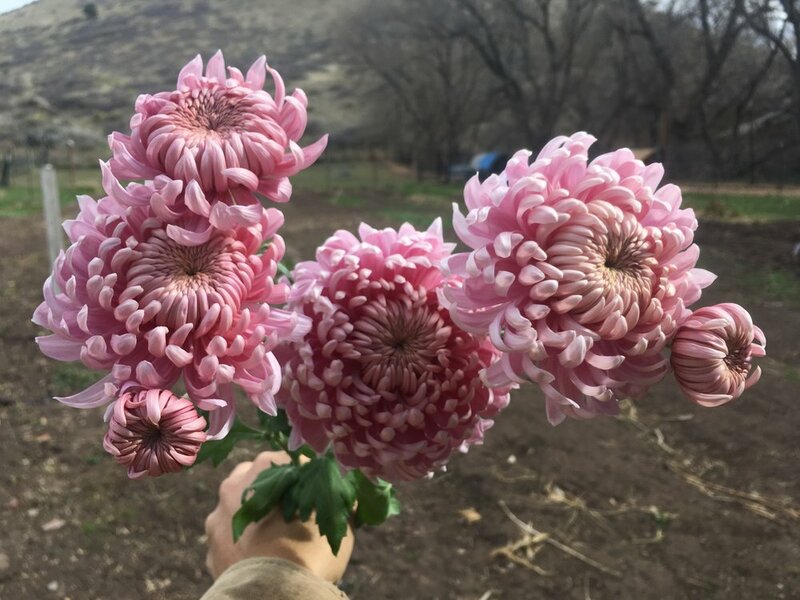 Mums were another variety I went whole hog for this year, and god did I love them! They started blooming in mid-September, and they were SO beautiful and SO long-lasting. We made stunning arrangements with them for our open house October 22nd - WEEKS later than I expect to have flowers. I actually had them into November, and I’m sure that they would have kept on going if I had kept watering them, but we had to shut off the watering system. I’m so glad I took the chance on a few cuttings from King’s Mums. One thing I've never gotten to grow well are China asters - they're always puny and never seem to germinate well - I end up with tiny patches and just a few flowers. But damn it if I don't keep trying because I have these visions in my head of how they'll be next year...there's always next year. Two people I will truly miss working with. And YOU are the hardest of all. This was the first year that I was managing people, and the entire operation, day-to-day on my own. It was not perfect, and despite all the successes in flower farming this year, my failures in people management still leave a bad taste in my mouth at the end of the year. I lost three employees this year - one I fired, one quit for personal reasons (those reasons threw the farm into turmoil as well), and the third left for another position. I had way more difficult conversations than I am honestly capable of handling. I never thought I would be an employer - it’s a strange thing! It feels SO good some days, and so terrible others, especially when your employees live on the same land and are your friends. Balancing friendship with being a boss is probably the hardest thing I’ve had to do as a human, and I’m not good at friendship in the first place. I’m not naturally empathetic or intuitive, so feeling others’ feelings and picking up on what is going on is not my strong suit. I got into farming to be with plants, not with people, so management has been my biggest challenge, and it’s definitely a huge weakness for me. I’m pretty darn competent in a lot of areas, but when it come to people, I’m a clumsy, unaware novice. Ask for what you need - if you don’t, don’t be bitter that you didn’t get it. Ask questions. Of everyone. Especially when you don’t want to talk about it. Face yourself & your fears: ask for feedback & ­– this is the hard part – accept it. Own up to your mistakes. Confront bad behavior immediately - especially when it’s your own, and even if you feel your bad behavior is justified. Care for yourself. You’re the boss, so no one else is going to make sure you take a break, that you eat lunch, that you have everything you need for that delivery, or that you don’t work all night after working all day. Be your own mama bear. I wonder if the rest of you out there struggle with managing your employees? What kind of solutions or strategies have you found? I know it’s a huge topic, but maybe not so huge in a farm-specific context. Let me know your thoughts on this post! Thanks for reading. We had our best spring ever, thanks to our ranunculus and anemones in the hoophouse, as well as our overwintered and early-in-the-ground annuals. Larkspur, bupleurum, bachelor’s buttons, and many more made our spring excellent. Godetia, aka Clarkia: I was really surprised by this plant! It was SO prolific, so much that we could not harvest it on time at all, but it filled out our bouquets beautifully and looks a bit like alstroemeria. We planted the Grace mix from Geoseed, and I loved all the colors. They’re bright, and the only ones I would consider planting separately would be the pure white, or the rose-pink, which has pink streaks in the middle of white petals. We put these out on the equinox along with many other hardy annuals. We did a second and third succession, but all seemed to blow up right around solstice - so it’s probably a day-length thing. The flower bible, Specialty Cut Flowers, says as much. Bupleurum & larkspur: We had great yields on our bupleurum, especially the patch we were able to overwinter. I’m planting lots more in the fall - in fact, they’re already in the ground. Our larkspur were also really great - tall, healthy, gorgeous blooms from the Sublime series, QIS, and the Earl Grey variety I got from Fedco Seeds on Floret’s recommendation. Fancy Smokey Eyes was another big winner - just a pale lavender, not quite white. Canterbury Bells: I had bad germination on these, but the plants that made it were so beautiful, and I absolutely fell in love with the shape of the flowers. Snapdragons: OFF the CHARTS. The ones we tried to overwinter were eaten by deer, but our spring plantings were incredible - such long stems, multiple branching blooms, incredible color. My faves were the Opus Lavender, Opus Plumblossom, Madame Butterfly Bronze, and then the Rocket series - Orchid especially. Cherry and Lemon were gorgeous colors as well, with such incredible flower form - strong, long spikes with many florets. Our last planting succumbed to rust, but we're still getting what we can. Definitely need a third succession next year. Everlasting, or Xeranthemum: Another surprise winner! Adorable little paper flowers that last and last, great for drying, for boutonnieres, crowns, and corsages. Just a tiny patch of 3 feet has lasted us the entire summer. They did take their time, but lord were they worth it! Stock: We had great results with stock all summer. I’ve always been afraid of it falling over and being short, but the Katz and Canneto varieties have been wonderful and strong all season, despite our heat - so don’t let anyone tell you that you can’t grow stock! They don’t look like the pictures, but that scent is absolutely worth it. I’ve yet to try the Quartet series, but may do so in the spring. Our last round of stock that I was trying to get to bloom for fall pretty much died in the tray - alas! Lisianthus: It was our first year with lisianthus - WOW. We bought 3 trays of plugs, got them in the ground in April, and were reaping the benefits by the end of July. They are amazing - so prolific, so many flowers I could NOT keep up. In our hoophouse bed, 3 trays must have given us thousands of flowers. We grew ABC White, Mariachi Mix, and Magic Champagne. I LOVED the ABC and all the Mariachi colors. The Magic were great but flopped open really quickly. I’m definitely investing more in this crop next year - including the Roseanne series and the Corelli light pink that I’ve seen all over Instagram. Rudbeckia: Oh my goodness. These plants are just GIVERS! Planting them early, I was concerned that they were stunted, and sad, but come warm weather, they shot up and gave us the most spectacular flowers - my favorites are the green-centered Prairie Sun, the classic Indian Summer, the rusty Cherokee Sunset, and the short but incredible Sahara, with those peachy, muddy colors. Planting them like cool flowers made an incredible difference - last year, our plants were short & didn’t give many flowers when planted out after last frost, but this year, wow. So worth it - I loved each and every one. 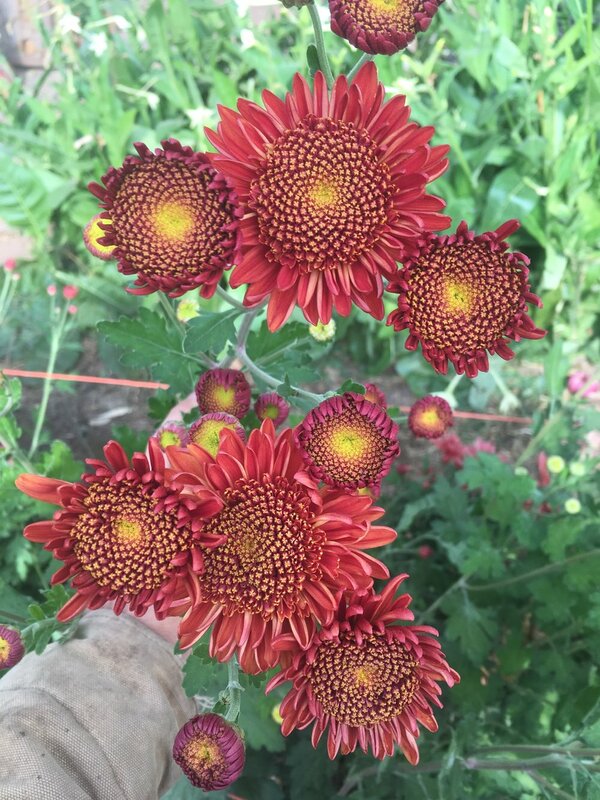 The varieties that didn’t do as well for us were the Goldilocks and Denver Double Daisy - lots of flowers, but poor vase life, and opened really quickly in the field. Castor beans: tall, gorgeous plants with tropical-looking leaves and bright, textural fruits on tall inflorescences. Very weird, but very useful. Trying a variety called 'Carmencita Pink' in 2018. Celosia: Sylphid and Flamingo Feather are consistent performers. Gomphrena: the hot G. haageana varieties, like QIS Orange, Strawberry Fields, and Carmine, are stunning, long-stemmed, and excellent for personal flowers. Nicotiana: I loved the grandiflora variety, plus the smaller-flowers "whisper" mix, and I'm planting WAY more varieties next year. This plant just keeps producing stems like crazy - no successions necessary. Sunflowers: Still loving the Pro Cut series, along with Soraya (probably my favorite) and Red Hedge, which I think is the best red. Sign up to get news & blog updates. Thank you! I’m so glad you want to keep in touch.